Traditional poached chicken is very popular in Hong Kong. If the chicken is just cooked through with silky smooth skin and the meat is succulent, it’s a high-praised dish that’s well-accepted by everyone. To make silky succulent poached chicken, it’s not that difficult as we thought. All you need to do is to submerse and soak the chicken in a bowl of iced water to stop the inner cooking once the chicken is done. The skin will be kept very smooth and the meat won’t be over-cooked. For making this special poached chicken, you can simply skip the soak-in-iced-water step, still can achieve the same effect. The simple trick is to prepare a bowl of cold spicy brine to get the cooked chicken soaked in it. It’s very straightforward and simple. Besides, we are very concerned about the food safety nowadays. Don’t just rely on the traditional way of testing chicken with a needle or chopstick. It’s not totally reliable at all. What testing method is reliable then? Please take a look at the tip in the notes section below this recipe. Enjoy good and healthy eat! Soak the dried prawns until softened. Drain well. Stir fry in a small pan without any oil over medium heat until aromatic. Set aside. Put all the ingredients (except the wine) into a deep pot. Add the dried prawns. Bring it to boil over medium-high heat. Reduce heat to medium-low and simmer for 15 minutes to bring out all the flavours and fragrance. Remove from heat to let it cool. Pour in the wine. Refrigerate for 3 hour until the brine turns cold. 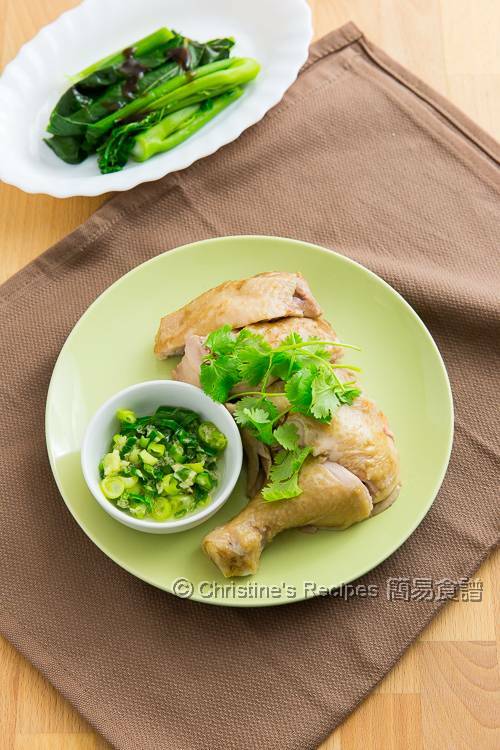 Place the chicken maryland pieces on top of the ginger and spring onion. Transfer to a wok or steamer to steam for 15 minutes over high heat, or until it’s cooked through. I inserted a thermometer to test the thickest part of the chicken thigh. It reached 75C / 165F. Immediately transfer the chicken into the cold brine and soak for 3 hours in the fridge. Serve cold or slightly reheat the chicken if you like. Heat some oil until it almost releases smoke, pour over the minced ginger and spring onion. Serve on side. Enjoy! According to the instructions from Hong Kong Center for Food Safety, The center of the thickest part of a poached chicken should reach at least 75C / 165F, whereas Australian government recommends at least 74C / 165F. When cutting the poached chicken, make sure that the juices are clear, without any blood inside. I found the traditional way to test with a needle or chopstick to poke through the thickest part with clear juice running out is not quite reliable. The recommended safety temperature is a little bit higher than that. The chicken meat is still tender though. No worries. It’s worth investing a thermometer for the sake of your family health safety. By soaking the chicken in the cold brine, the inner cooking will stop. Let it absorb all the flavours of the brine. 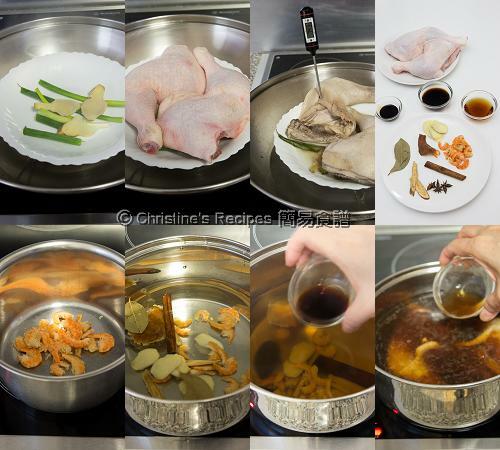 You may cook the chicken in the brine directly instead of steaming for convenience. Also make sure the chicken is cooked through. All the spices are available at Asian grocers. 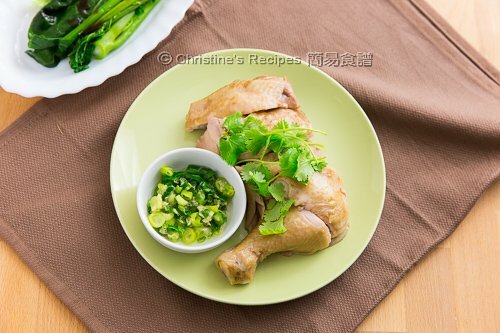 Love the simple preparation and I bet the chicken taste wonderfully flavourful and delicious. It really tastes wonderful, Angie. I made this dish twice in a row for the past previously week. I like the chicken well done or at list medium. If it is a poached chicken it should be boiled for good. I always dreamed about succulent chicken so I will try to follow your tips. Thanks for the recipe. However, I have a question. In point 2, you said, "Refrigerate for 3 hour until the brine turns cold." And in point 3, you mentioned, "Immediately transfer the chicken into the cold brine and soak for 3 hours in the fridge." So does it mean the cooking time is 45 mins + 6 hours? Hi Christine, does it matter if I soaked the chicken overnight or more than 3hrs? After the chicken is cooked through, it'll stop the cooking by residue heat inside once it's soaked in the cold brine. The chicken can be kept soaking in the cold brine in fridge over night or at least 3 hrs. If soaking overnight, the flavours of chicken will develop more in depth and intense. May I know what you do with the left over brine? I just make another chicken dish with it as soon as possible. Then I discard it. How should I reheat this to keep the nice texture of the chicken? Do I need to steam it again? If you want to reheat it, then use steaming. You can't keep the original, perfect texture after 2nd round of steaming. It's so sad that we can't escape from the natural law. The only thing you can do is not to steam it too long, and avoid overheating.